Talk about an In Thing! to find him so he can celebrate life living with you. online that you will find a bilby toy animal. 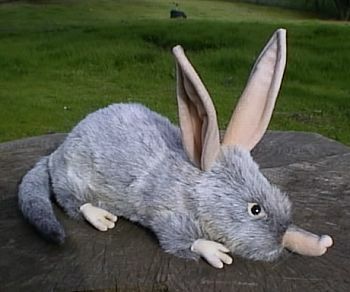 Stuffed Bilby toy animal with such Charm and Personality! for children, and for all Bilby & animal lovers everywhere. Delightfully Dashing as can be, and reasonably priced. able to survive in some of the world's harshest deserts. much milder conditions of Australia and New Guinea. has a longer snout and much bigger ears. 12 to 21 1/2 inches long, they live from 3 to 5 years. shortness of the gestation period which is only 13 days. About every 9 weeks bilby's can have from 1 to 3 babies. The bilby is under serious threat of extinction.